LYLE CRAKER HAS a number of plants on his mind. An agronomist and professor in the Department of Plant, Soil & Insect Sciences at the University of Massachusetts, Amherst, he's currently analyzing the active ingredients in black cohosh, which is used to alleviate symptoms of menopause. He is also studying goldenseal, a native American plant that shows promise as a treatment for some skin irritations, and exploring the possibility that certain Chinese medicinal plants could be cultivated in Massachusetts for research purposes. There is another medicinal plant that Craker would like to grow and study, but in this instance, his prospects will be determined in a courtroom. Since 2001, Craker has been seeking a license from the Drug Enforcement Administration to establish a medical-marijuana growth facility at UMass-Amherst. It would be the second such facility in the US; at present, the National Institute on Drug Abuse, a federal agency, produces the only legal supply of cannabis in the country at the University of Mississippi. The DEA lists cannabis as a Schedule I drug, meaning that it has a high potential for abuse and no accepted medical uses. However, marijuana is unique on the Schedule I roster-which also includes cocaine, LSD, and MDMA (Ecstasy)-as the only substance that is not available from multiple independent producers for clinical research purposes. ``There are two issues here: quality and access," says Rick Doblin, the Belmont-based founder and president of the nonprofit Multidisciplinary Association for Psychedelic Studies (MAPS), which is sponsoring Craker's suit against the DEA. The government holds that its Mississippi operation obviates the need for a second crop. Craker and MAPS counter that NIDA cultivates a product of poor quality and does not make it readily available to qualified researchers, and point to NIDA's previous refusals to supply cannabis to two scientists with FDA-approved protocols as grounds for establishing an independent facility. On April 20, the Food and Drug Administration released a controversial statement declaring that marijuana ``has no currently accepted medical use in treatment in the United States." The outcome of Craker's case-especially if it reaches federal court, as is likely-could realign the terms of the national debate over medical marijuana. For now, the suit, which has the expressed support of Senators Edward Kenedy and John Kerry, as well as 38 members of the House of Representatives, is in the hands of DEA Administrative Law Judge Mary Ellen Bittner, who's expected to make her recommendation to the agency on the application sometime this summer. Final briefs were filed on May 8. There is abundant anecdotal evidence and personal testimony to support myriad uses of cannabis to treat symptoms of cancer, AIDS, multiple sclerosis, and other ailments. As the FDA reiterated in its statement, however, scant clinical evidence exists to back these claims-or, for that matter, to contradict them. Paradoxically, the controls on official research of cannabis in America undermine both the medical-marijuana movement's efforts to prove the drug's benefits and the government's assertions of its dangers. Strangely enough, the case for pharmaceutical cannabis may, in the end, come down to good gardening-and may depend on whether the government is willing to give up its monopoly on marijuana. Cannabis sativa was once widely recommended by American physicians as a mild sedative, much as the popular herbal treatments valerian and camomile are used today. By 1937, however, the drug had been effectively outlawed by the Marihuana Tax Act. The Federal Bureau of Narcotics had aggressively pursued this ban with Congress, and cited marijuana's perceived popularity as a smoked narcotic among Mexican farm laborers, hysterical tabloid reports on its deranging effects, and results from tests on canine subjects. Punishments for pot-related offenses remained light into the 1980s, and President Carter favored decriminalization. It wasn't until the War on Drugs gathered momentum midway through the Reagan administration that penalties became fearsome enough to drive marijuana growers indoors-which, it turned out, was the best possible place for a cannabis plant to thrive. In ``The Botany of Desire: A Plant's Eye View of the World" (2001), author Michael Pollan has an epiphany while visiting a ``grow room" run by an acquaintance. ``[I]t dawned on me," he writes, ``that this was what the best gardeners of my generation had been doing all these years: They had been underground, perfecting cannabis." From the standpoint of both the scientist and the connoisseur, perfect cannabis can be achieved with unseeded, genetically identical female plants. The original crop is harvested from seeds, and subsequent generations are bred from cuttings. Characterized by the ``buds" from which marijuana derives one of its many slang names, these virgin female plants carry high levels of molecules unique to the cannabis plant, called cannabinoids. The two most well-understood cannabinoids are THC and CBD, which many physicians and patients believe can alleviate nausea, stimulate appetite, ease pain and anxiety, and lessen the muscle stiffness and spasms associated with MS. 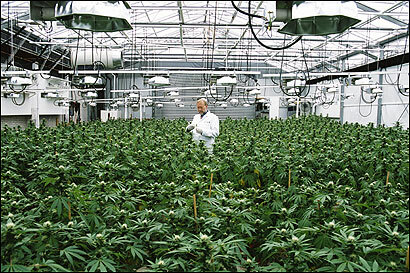 In the UK, the GW Pharmaceuticals company has a government license to grow cannabis under highly regulated conditions. At a secret location in southern England, in greenhouses that are computer-controlled for temperature, humidity, and light, the GW research team has compiled a veritable library of plant strains, with precisely determined ratios of cannabinoid content. The upshot is Sativex, a liquid extract of equal parts THC and CBD that is sprayed under the tongue to treat neuropathic pain. Britain permits the use of Sativex in MS patients, and the drug has been approved for marketing in Canada. Cannabinoids also have a presence on the US market, in the recently approved Cesamet, a synthetic cannabinoid, and in Marinol, a THC extract in pill form that the FDA approved back in 1985. But Marinol contains no CBD, and ingested THC is metabolized differently from smoked marijuana-the palliative effects take much longer to kick in, and the psychoactive effects are far stronger. Craker's intentions for a Massachusetts site are similar to the GW template: an indoor facility housing female clones, with strains made to order for researchers according to exact cannabinoid content. In contrast to the methods practiced by GW and by America's outlaw gardeners, however, NIDA grows the majority of its marijuana outdoors, under conditions that result in unwanted pollination and, according to some users, a harsh product. The Institute harvested its most recent marijuana crop in Mississippi in 2002, and stockpiled the supply in vaults and freezers. Cannabinoid content of NIDA pot is highly variable, and a THC potency of 6 to 8 percent is about as high as researchers can hope for. By contrast, Canada distributes medical marijuana to patients at 12.5 percent, and medical marijuana in the Netherlands ranges from 13 to 18 percent potency. ``I've spoken to patients who have used [NIDA marijuana], and they've said it's everything from worthless to other descriptions I should not use," Craker says. ``The patient has to smoke one cigarette after the other to get any effective relief from pain." Ethan Russo, a neurologist and now a senior medical adviser to GW Pharmaceuticals, conducted patient studies with NIDA marijuana and reported, ``A close inspection of the contents of NIDA-supplied cannabis cigarettes reveals them to be a crude mixture of leaf with abundant stem and seed components.. . .The resultant smoke is thick, acrid, and pervasive." Then again, it's not in NIDA's job description-or even, perhaps, in NIDA's interests-to grow a world-class marijuana crop. The institute's director, Nora Volkow, has stressed that it's ``not NIDA's mission to study the medicinal use of marijuana or to advocate for the establishment of facilities to support this research." Since NIDA's stated mission ``is to lead the Nation in bringing the power of science to bear on drug abuse and addiction," federally supported marijuana research will logically tilt toward the potential harms, not benefits, of cannabis. Under these circumstances, evidence in support of medical marijuana tends to materialize as a byproduct, not a primary goal, of official research. For example, Donald Tashkin of UCLA intended to demonstrate via a NIDA-supported study that marijuana smoke increases the risk of lung and upper-airways cancer. But the findings of the study, announced this past week, indicate that heavy marijuana smokers actually show lower cancer rates than tobacco smokers, indirectly supporting claims by medical-marijuana proponents for the tumor-inhibiting properties of cannabinoids. At the moment, federal law prohibits pot cultivation even in those states (11 at last count) that have passed medical-marijuana referenda. In 1996, Californians voted in favor of the Compassionate Use Act, also known as Proposition 215, which permitted the use and cultivation of marijuana by qualified patients. According to the act, patients with a referral from a physician can obtain medical marijuana from one of some 200 dispensaries or ``buyers' clubs," which procure their high-grade stock from tucked-away farms and discreet greenhouses. Despite the ever present threat of a crackdown from the federal government, these companies are thriving-some clubs even offer their employees healthcare benefits and 401(k) plans-and have created a market for medical marijuana. ``For evidence in support of the healthy competition fostered by a marketplace economy, you need only to look at the quality of marijuana available in California," says Mark Blumenthal, who directs the nonprofit American Botanical Council of Austin, Texas. ``Pluralism and economic competition are good for the consumer. We generally don't allow and empower monopolies in our culture-it's contrary to the tenets of our economic system." The invocation of a government monopoly on marijuana helps to explain the strange bedfellows on the pro-cannabis side of this issue. The conservative historian Richard Brookhiser and the late Reagan aide Lyn Nofziger both spoke out in favor of medical marijuana, and supporters of Craker's suit against the DEA include not only several nurses' associations and the United Methodist Church but Grover Norquist, president of Americans for Tax Reform and a staunch defender of small government and an unfettered free market. ``The use of controlled substances for legitimate research purposes is well-established, and has yielded a number of miracle medicines widely available to patients and doctors," Norquist wrote in his letter of support. ``This case should be no different. It's in the public interest to end the government monopoly on marijuana legal for research." Given Norquist's many successes on the lobbying circuit, perhaps all medical marijuana needs is a new pitch man. Jessica Winter is a freelance journalist in New York. She writes for The Village Voice, the Guardian (UK), Time Out London, and other publications. YOUR VIEW: Should the government have a monopoly on marijuana?